You can automatically register a new customer for a webinar you have created with Webinar Ignition. Step 2: Click on Webinar Ignition, then click “Show License Key”. Step 3: Inside PayKickstart, click on the top right navigation and click “Integrations”. 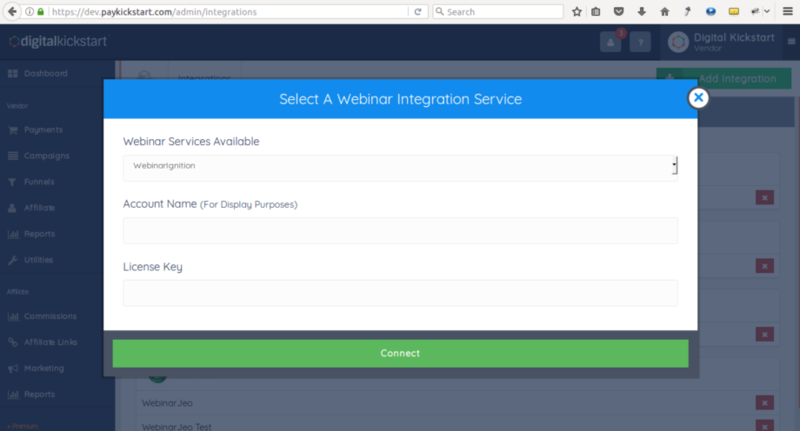 Then click on the sub-navigation “Webinars” and click the “Add Integration” button. Select Webinar Ignition from the dropdown, give it a display name and enter the License Key provided to you from Webinar Ignition. Step 4: On the Edit Product screen, go to step 3 “Integrations” and select which webinar a customer should be added to upon purchase. Reinvented Payment and Affiliate platform, empowering vendors and digital publishers with the tools to sell their products online. © 2019 – PayKickstart LLC. All Rights Reserved.